Janice Heck Writes | Power-up Your Writing! Build Your Writing Craft. Sometimes a blog post fits several categories. “A Quest of Another Kind” fits that description. This post, originally written for a WordPress Weekly Photo Challenge deserved to be on my writing blog as well as on http://triumphoverterror.com, a joint blog with Bob Ossler and myself. My friend, Bob Ossler, and I set out on a quest more than sixteen months ago: to write his memories of his work as a volunteer chaplain at Ground Zero in New York City after 9/11. Bob is a talker and a storyteller. He is not a writer. But he joined a writers’ critique group that my friend, Kathryn Ross, and I organized at Cumberland County Community Church, in Millville, NJ. Bob started telling his Ground Zero stories and stopped us cold. We listened to story after story, spellbound and teary-eyed. I was in New York City at the 9/11 Memorial Museum a few weeks ago and spotted this creative spelling for omelet. Or is it omelette? Evidently, the French and British prefer the French spelling of omelette, whereas Americans seem to be a bit more independent and prefer omelet. The more creative species spell it any way they want! This little American deli in New York City preferred to do it their own way: omellette. Hmmm. Sunday morning. Yummy eggs, beaten, cooked, covered with asparagus and feta cheese; or topped mushrooms, onions, and peppers, and cheese then folded over and served on a warm plate with hot buttered crispy rye toast. Nothing better. It doesn’t matter how you spell it. Just make it hot and tasty. Thanks. Somehow, I don’t really trust a source that gives scare headlines using bad grammar. There’s just no credibility there. No tainted water in this lake at Horizons at Woods Landing, Mays Landing, NJ. “Write, publish, and promote your work one post at a time,” Amir suggests. Great advice. Grab a cup of coffee and go to it. Now Jon Morrow has hosted Cathy Preston on his blog, Smart Blogger, (September 1, 2016). Preston writes about this same topic in this excellent and comprehensive post: From Blog to Book: The Simple Strategy Smart Authors are Using in 2016. Blogging a book is smart. You build up the content over a period of time, and it’s tested by readers. You collect responses and tweak the content when readers toss in good suggestions or challenge you (politely, of course!) on what you have written. Bloggers, Preston says, have several advantages over wannabe writers: you have a writing habit, and you have developed an audience. She also says that bloggers have one more thing: gumption! Nice to get compliments like that. But what if you have all that content in your head, and you can’t get it down on paper? Ground Zero Chaplain Bob Ossler had this problem. He has an eidetic memory for details of events, but perhaps because of his eclectic learning style, he has difficulty getting his stories down on paper. We met at a writers’ critique group which my friend Kathryn Ross of The Writers Reverie and I started in May of 2015. Bob came to that first meeting and told us one compelling, jaw-dropping, tear-jerking story after another of his interactions with firefighters, police officers, search and rescue workers, volunteers, and everyday citizens who visited Ground Zero to get an understanding of the magnitude of the terrorist attacks of September 11, 2001…in many cases, to get a bit of closure after losing a loved one in the exploding, crashing towers. And he told of us his exasperated and failed attempts to write his memories of Ground Zero and September 11 and its aftermath. We had a suggestion for him. Write emails. Write one email at a time about your experiences. He wrote those emails to me, and I became his mentor, writing partner, and editor. The writing group became Bob’s support team and kept the encouragement going strong. Here’s an excerpt from the preface of our book Triumph Over Terror that tells how we published his book from his emails. Writing this book was the hardest work I have ever done. I’m a talker, not a writer. I’m an ordained chaplain, not a psychologist. I love people and want to encourage and support them in times of crisis and need, whenever and wherever the opportunity arises, whatever the mode of communication. And I want to share God’s love and comfort with everyone. I worked at Ground Zero for five tours of duty in the fall of 2001. My first attempts, years ago, to write about September 11, 2001 and its aftermath ended in torrents of tears, frustration, and failure as recalled events tore open unhealed heart wounds. Now, fifteen years later, for the 15th anniversary of 9-11, encouraging writer friends pushed me, yes, even lovingly commanded me to write through the pain, not only to bring closure for myself, but to bring God’s message of comfort to others suffering through crises. My friends assured me that my words would encourage others to stand firm in their faith despite heartache and suffering. “Then write emails,” she suggested. And so, I began to write again. On this latest attempt, I cried as I wrote out streams of emails, hundreds of them, about random and out-of-order Ground Zero happenings, about memories long buried. These missives soon fell into clusters, then into chapters, then into this book. Incident after incident from Ground Zero flowed back through my mind in startling detail, releasing long pent-up emotions. But this book is not a retelling of the sequence of happenings on 9/11. Triumph Over Terror is my reflection on the tragic assault on New York City and our country and how the hearts and minds of those affected by the events suffered, physically, emotionally, and spiritually. Over time, God helped me and others triumph over this terror to find peace and renewed faith despite the graphic images scrolling through our minds at random times. Of course, writing Triumph Over Terror was a bit more complicated that that. Bob and I spent many hours together as we rehashed scenes, and I begged him for even more details. At times I felt like I was pouring salt into his newly reopened heart and spirit wounds. Bob shed more tears, but he didn’t quit. He had gumption. He wanted to get his story out, not only to clear his overstuffed mind, but to share his story in the hopes that it might help others going through terrors or trials of their own. Bob didn’t quite tell the story in sequential order, and sometimes he told three or four stories blended together. We had to revisit stories many times and separate out the details. As he’d read a draft of one story out loud in our meetings, he’d stop and start talking…telling more and more details extracted from the stash in his memory vaults. The startling, jarring, and even shocking details often limited the amount of time we could work. The emotional strain pulled on us both, but primarily on Bob. With a first draft of a number of chapters in hand, we attended the Greater Philadelphia Christian Writers Conference organized by Marlene Bagnull in August of 2015. There editors, publishers, and other writers gave us feedback on the book and encouraged us to keep working. One publisher, Scoti Springfield Domeij grasped the scope, focus, and intent of the book and encouraged to write more, then submit our new chapters to her company, Blackside Publishing. Long story short, fifteen months after our first writers group meeting, we ended up with a published book, Triumph Over Terror. Click here to check out this book on Amazon. Visit Chaplain Bob Ossler’s website at www.Triumphoverterror.com to read more excerpt of his book and to find out more about his life’s ventures. Click here to go to Amazon for How To Blog a Book. Do you remember learning this spelling rule in third grade? The printer who made this sign forgot this rule. I went by this same strip mall restaurant a few weeks later, and saw a new sign on the lawn featuring smoked ribs and FRIED shrimp. Someone learned a new rule, but it cost him a few pennies in the process. the publication of Triumph Over Terror by Chaplain Bob Ossler with Janice Hall Heck. How do we triumph over the hard things in our lives? Firefighter, paramedic, and ordained chaplain, Bob Ossler spent 45 days at Ground Zero comforting families of victims who died in the 9-11-2001 attacks on the World Trade Center in New York City. His observations and memories of those days along with his interactions with people he met in the worst circumstances of their lives make compelling reading. In Triumph Over Terror, Chaplain Bob Ossler shares how he conquered the continuous recycling of tormenting memories of events and sights that assailed him during and after the terrorist attacks of 2001. What do Ossler’s insights reveal about finding meaning and purpose in the thick of chaos and personal tragedy? Ossler chronicles the best of humanity–acts of courage and goodness in the midst of overwhelming devastation. While some scenes may make you cringe, the overpowering message of this book is positive: with God’s help, we can overcome. From the broken fragments of glass, steel, and men, Chaplain Ossler’s mosaic of God’s grace unveils the outpouring of generosity, heroism, and unity of people who stepped up to do something…anything… to help restore New York and America’s hope, pride, and will. Ossler’s stories will bring tears to your eyes and smiles to your lips, and in the end, you will feel encouraged by the stories of ordinary people serving in extraordinary ways during the aftermath of that never-to-be-forgotten day. But this book is not just about the events of 9-11. It is a book of life’s lessons learned through tragedy and chaos. In the process of comforting the mourners, the frightened, and the heartbroken laborers sifting through millions of tons of carnage, Ossler learned about the indomitable human spirit in the midst of unimaginable horror and how that spirit can conquer chaos. As terrorist attacks continue to assault humanity, Triumph Over Terror reveals how your spirit can triumph over terror, chaos, or heartache of any kind. Take a few seconds and order Triumph Over Terror from Amazon here. It’s and its confusion consistently hits the top of the most common error charts. But wait, Superman can help you remember when to use the contraction it’s. 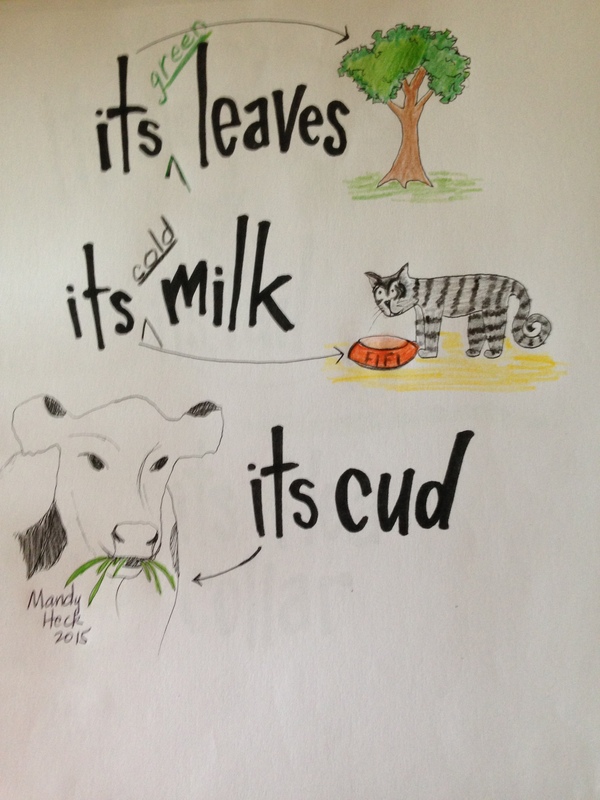 Using contractions in our speaking and writing makes our language flow more naturally. Without contractions, our language sounds more formal, rigid, stilted, and unnatural. If you want to sound conversational in your writing, use contractions but remember to use the apostrophe correctly. Stop and think about Superman when you use the contraction it’s. 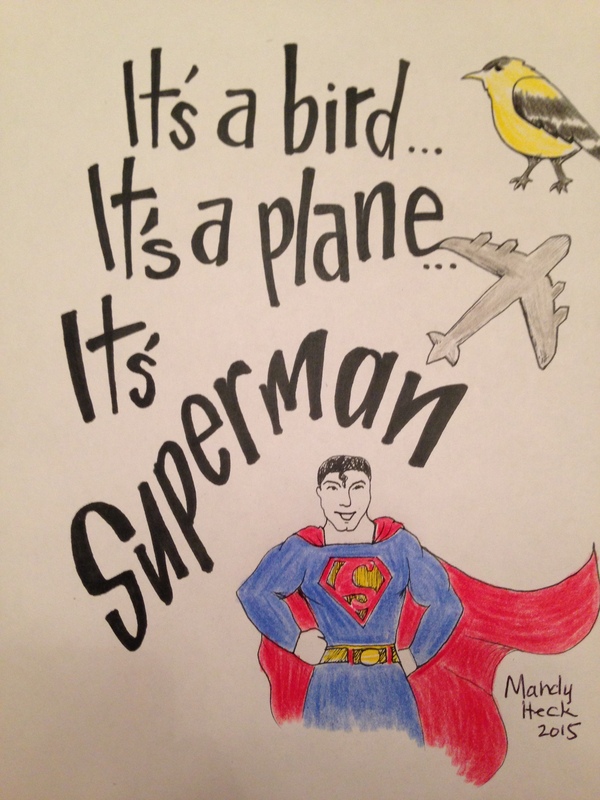 Superman loves apostrophes. Special thanks to Mandy Heck for her artwork. 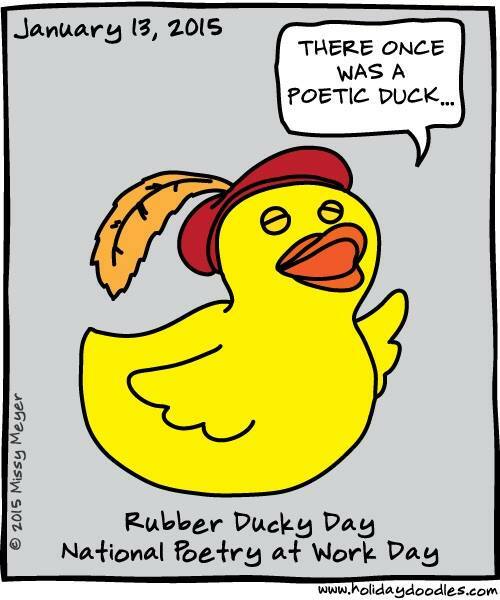 It’s Rubber Ducky Day and National Poetry at Work Day! Celebrate! Of all the possessive pronouns, the simple its causes the most problems. It is most commonly confused with the contraction it’s (it is). Possessive pronouns work as adjectives to limit nouns. The possessive pronoun its is usually not found at the beginning of a sentence. The poodle lost its pink diamond-studded collar. The maple tree lost its red and yellow leaves. The gray kitten lapped up its cold milk. The cow chewed its cud. 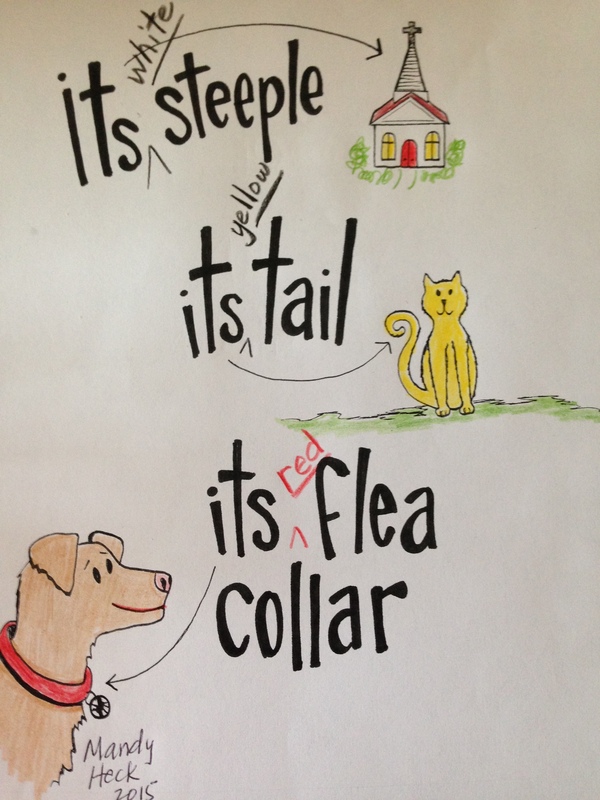 It’s and its are commonly confused words in writing. You see examples of this confusion on signs and social media sites every day; yet this common mistake can be easily checked and fixed. Possessive pronouns never use apostrophes to show possession or ownership (my, his, her, its, our, your, their). Which one: its or it’s? Check 1: Does the sentence make sense using the contraction it’s (it is) in place of the possessive pronoun its? 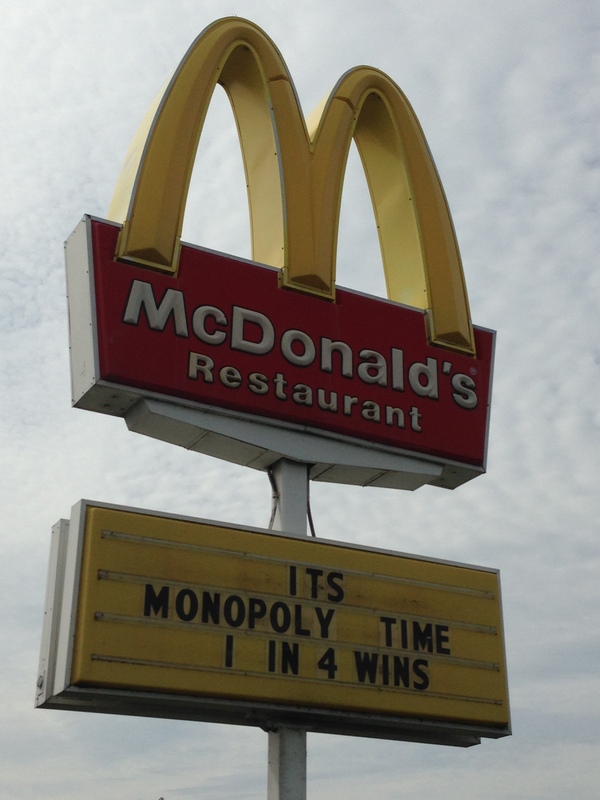 McDonald’s sign makes sense with the contraction it’s for it is. Therefore, McDonald’s made a mistake on its yellow sign. The sign needs the contraction it’s (it is) and it’s (it is) not the possessive pronoun its. The possessive its is not usually found at the beginning of a sentence. McDonald’s made a mistake on its yellow sign. More sentences with the possessive pronoun its. The dog chases its fluffy tail while the kitten chews its paw. The tree lost its yellow leaves in the windstorm. The members of the church painted its tall steeple and its white front door. The store advertised its January sale in its display window. His truck lost its extra wheel. Do you see the position of its in these sentences? Do you see the adjectives tucked in after its and before the nouns? Both of these clues help you identify the possessive pronoun its. These sentences make sense using the possessive pronoun its. This is my dog. Its name is Blackey. It’s chewing its tasty bone. The third sentence uses both it’s (contraction for it is) and its (possessive pronoun). Use these clues to help you use its and it’s correctly.